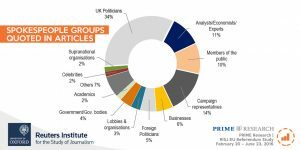 A new report from the Reuters Institute for the Study of Journalism reveals that UK press coverage in the weeks leading up to the EU Referendum was dominated by pro-Leave articles. The report, UK press coverage of the EU Referendum, examines how the UK press covered the EU Referendum story, and looks at what the key arguments, spokespeople, tone of articles and areas of focus were in the weeks before the nationwide vote. Produced in partnership with media insight specialists PRIME Research, the report includes analysis of two days of press coverage each week for the London editions of nine national newspapers, over the four months of the campaign. Dr David Levy, Director of the Reuters Institute and one of the report’s authors says: “The research reveals a picture of highly polarised press coverage, reliant on a narrow range of voices, and where coverage was relatively more focused on the contest itself and personalities than any of the complex issues at stake. Of the articles focused on the referendum, 41% were pro-Leave, while 27% were pro-Remain, creating a dominant pro-Leave presence. 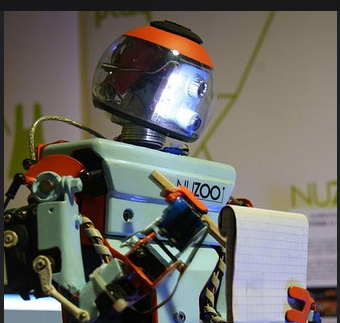 (See Fig 4.1). 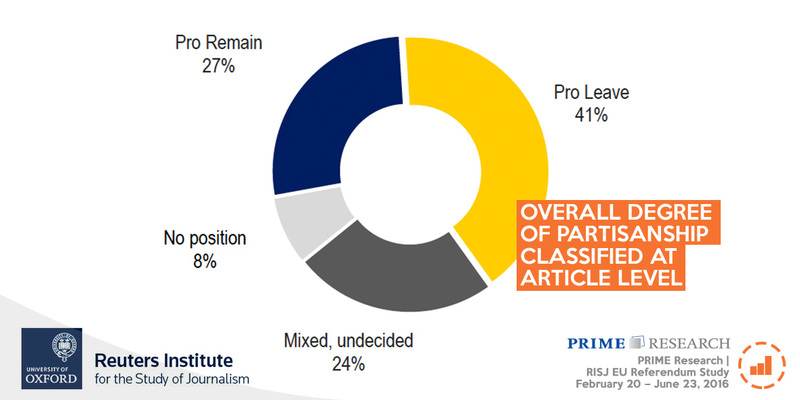 After factoring in the reach of different newspapers, the pro-Brexit dominance is further accentuated, with 48% of all referendum-focused articles pro-Leave and just 22% pro-Remain. Six out of the nine newspapers followed this pro-Leave dominance, with the strongest positions in the Daily Express, followed by the Daily Mail and the Sun. 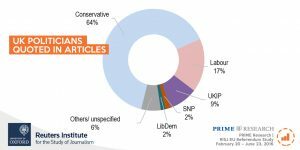 The Daily Mirror had the highest share of pro-Remain articles, followed by the Guardian and the Financial Times. 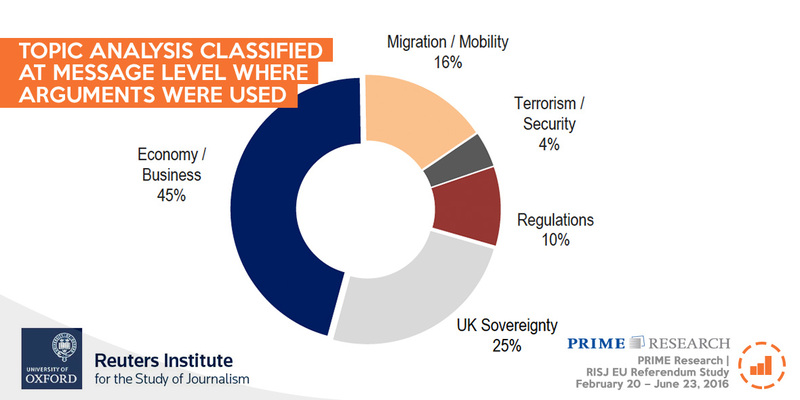 The economy was the most cited referendum issue covered in articles, followed by sovereignty and migration. (See Fig. 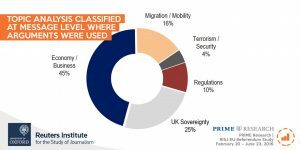 5.3) The economy was cited in both pro-Leave and Remain articles, but sovereignty and migration skewed heavily to pro-Leave articles. 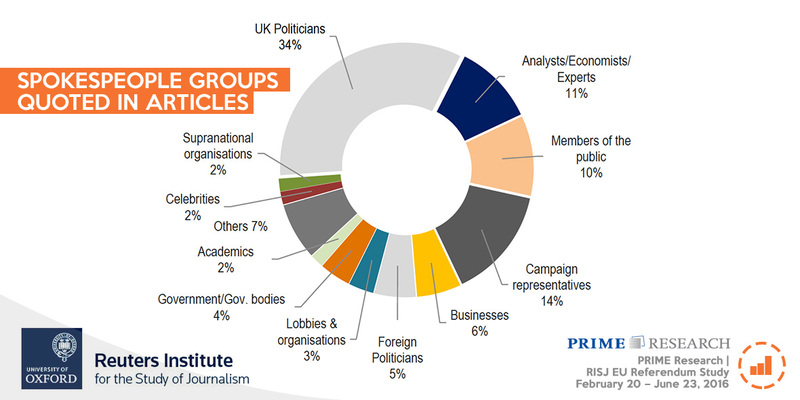 Almost half of spokespeople cited in articles were either UK politicians or campaign representatives, while analysts/experts made up 11% of spokespeople cited, and academics just 2%. Foreign politicians made up 5% of spokespeople cited. (See Fig. 6.1). Of the small number of academics quoted, one, Professor Patrick Minford, heavily associated with the Leave campaign, accounted for a fifth of all quotes on our sampledays. 64% of UK politicians cited in articles were Conservative, and 17% Labour. (See Fig 6.3).The most quoted politicians during the campaign period were former PM David Cameron (quoted in approximately 14% ofarticles) and Boris Johnson (10%). Current PM Theresa May kept a relatively low profile as the eleventh most cited politician. Labour leader Jeremy Corbyn was the eighth most cited politician, quoted in just 3% of articles. This trend was true even in the left-leaning press; he was quoted in 3-4% of articles in The Guardian and Mirror, about a third as many times as David Cameron or Boris Johnson. The report finds marked differences in tone between the Leave and Remain arguments in the press. 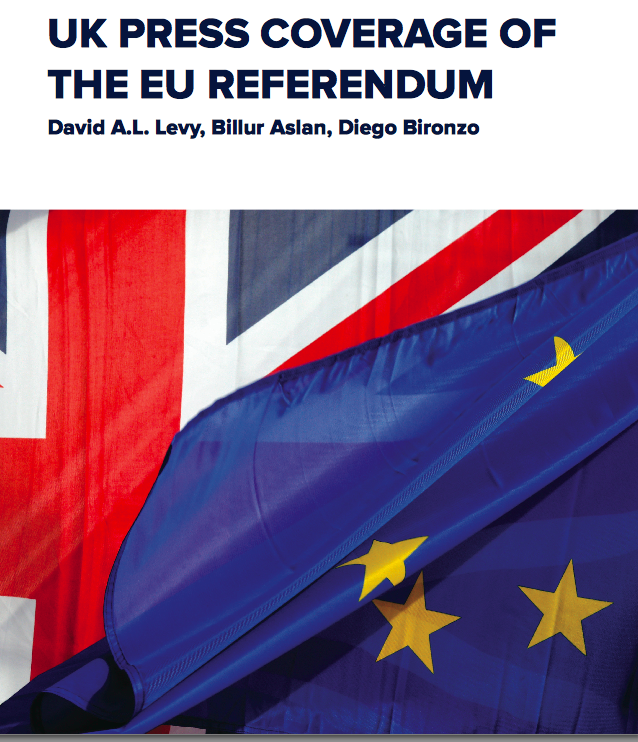 While the pro-Remain articles focused largely on the single issue of the economy, they adopted a generally very negative tone, apparently reluctant to use positive language, and gave pessimistic forecasts of a pro-Brexit future. In contrast, pro-Leave article sadopted a more positive tone, balancing criticism of the status quo with hopeful messages for a pro-Brexit future. Pro-Leave articles did play to fears, notably around migration and sovereignty, but their future-oriented messages were more optimistic.